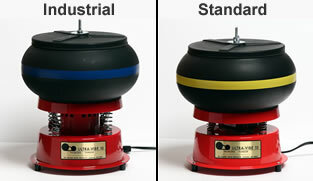 A small rotary rock tumbler with a two-pound capacity rubber barrel for quiet operation. This kit has everything you need to start tumbling. A small rock tumbler kit with everything needed to tumble your first batch of rocks. Larger than the MP-1 shown above with an overload- protected motor. This tumbler has two three-pound capacity rubber barrels. A great tumbler for the beginner or for two people to share. This rock tumbler has a 12-pound capacity barrel that will process about 8 pounds of rough. A durable mid-size tumbler with a high quality motor and a metal base. The largest rotary rock tumbler that we sell. It has a 15-pound capacity metal barrel with a rubber liner for quiet operation. It will process about 10 pounds of material. 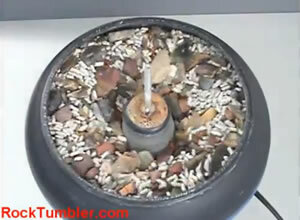 This is a new small capacity vibratory tumbler designed to tumble polish about 4 pounds of material. The U-V10 processes about 10 pounds of rough rock into polished stones. This is the industrial version designed for rock tumbling. The industrial version of the U-V18 for rock tumbling. 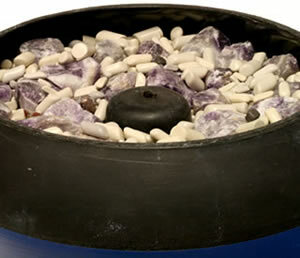 It processes about 18 pounds of rock into polished stones. The high speed Model B for cleaning brass cartridges. The 3000 RPM motor is twice as fast as the low speed. NOT FOR ROCKS. "Thumler's Tumblers" is the brand name of rock tumblers manufactured by Tru-Square Metal Products Company of Auburn, Washington, since 1960. They are quality machines that will last for years. "Thumler" is the family name of the people who invented these popular tumblers - and members of their family still run the business and manufacture the tumblers today. Every Thumler's Tumbler has a factory warranty that allows you to buy with confidence. Many of our customers tell us that they received a Thumler's Tumbler when they were young, used it with their children, and now use that same tumbler with their grandchildren. We received an A-R2 tumbler as a gift from our father in the 1970s that tumbler still works great today! He never knew where that gift would lead us. Why Do We Sell Thumler's Tumblers? We have sold thousands of rock tumblers made by various companies. We have also communicated with thousands of people who have purchased rock tumblers and had questions about them - or problems with them. This gives us the ability to have a highly informed opinion about the many types of rock tumblers in the market. We know which tumblers satisfy customers and which ones disappoint. We know which ones have a long life and which ones fail quickly. Based upon that experience we sell a small number of rock tumblers - the ones that satisfy our customers. We believe that Thumler's Tumblers satisfy customers because they have a very simple design, they produce nice tumbled stones, they are easy to use, and they last a very long time. Oiling Thumler's Tumblers: Thumler's Tumblers should be oiled after each month of operation. The motor and bearings should be oiled. Oiling prolongs the tumblers life and keeps the bearings from squeaking. It is an easy job that takes just a few minutes. This article shows you how to oil them and what kind of oil is needed. Thumler's UV Tumblers Guide: Tips on how to operate, how to reduce the noise level, and how to properly maintain your Thumler's Ultra-Vibe tumblers. VIDEO: U-V10 Operation and Instructions: The key to success with Thumler's vibratory tumblers is adding just the right amount of water and using media to improve the tumbling action. This video and article shares how we use this tumbler. 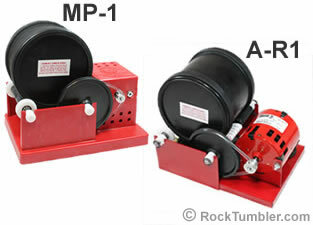 Compare the MP-1 and A-R1 Tumblers: Thumler's Tumblers MP-1 and A-R1 tumblers are our two best- selling tumblers. This article compares and summarizes the differences between them. 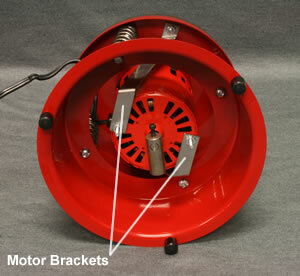 U-V10 Motor Replacement Instructions: After many years of use the motor on a Thumler's U-V10 tumbler may need replaced. 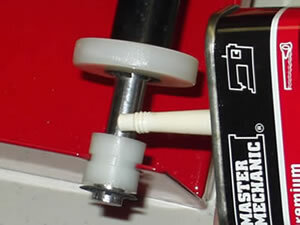 The motor can be changed with a few common household tools. Did you know there are two versions of the UV-10 and UV18 vibratory tumblers? Thumler's manufactures an industrial version and a standard version for each of these tumblers. Learn how to tell them apart so you know you're purchasing the one that will work best for your needs. Thumler's Tumbler Parts: We carry one of the largest selections of parts for Thumler's Tumblers on the internet. We have parts for every Thumler's rotary tumbler being manufactured and parts for the U-V10 and U-V18 vibratory tumblers. How Big is the Model B Barrel? Some people want this information to determine if the barrel can handle the materials that they want to tumble. Others want to know if the barrel or its liner can be used with a tumbler or barrel that they purchased a long time ago.